The founders of the automated restaurant Spyce (from left to right): Luke Schlueter, Kale Rogers, Michael Farid, and Brady Knight. On Friday night in downtown Boston, you could sample the cuisine of Chef Daniel Boulud in two distinctly different venues. The Michelin-starred French chef will be in town cooking pancetta-wrapped stuffed trout to mark the 20th anniversary of No. 9 Park, the Beacon Hill restaurant. The four-course meal, with thoughtful wine pairings, will set you back $295 a person, not including tip. But a few blocks away, you could purchase a Thai bowl — roasted chicken, bok choy, brown rice, curry sauce — for $7.50 at Spyce. Boulud is the culinary director at the Washington Street fast-food outlet, which opened in May. He also is an early investor in Spyce, which plans to announce Friday that it has raised $21 million in fresh venture capital funding. It’s a big bet on a young startup company that is building most of its own highly automated food-production equipment. 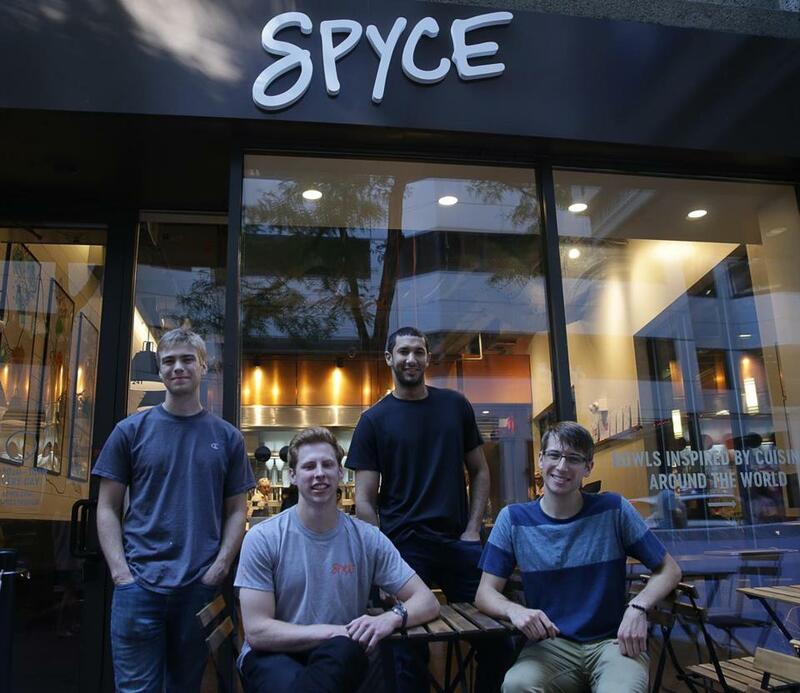 “We want Spyce to be the next big fast-casual restaurant,” says Michael Farid, the Somerville company’s CEO and cofounder and a 2016 graduate of MIT, with a master’s degree in mechanical engineering. When Spyce isn’t busy, it can be an extremely efficient dining experience for a customer. On a Thursday in early August, there was no wait, and I walked up to one of the restaurant’s touchscreen kiosks to order lunch. I paid with a credit card, and in four minutes an Indian-style bowl with chicken and tikka masala sauce was ready for me. What makes Spyce different from any other counter service establishment is the automated system that assembles your meal. Meats, veggies, and grains are dropped automatically from hoppers into a spinning wok in the proper amounts. (Ingredients have been chopped and pre-cooked in an off-site commissary overnight.) A bright orange robot shuttles back and forth between the seven woks, dispensing the right sauce for your dish. A screen above each wok displays your name as the meal is being prepared. When things have been mixed sufficiently, the wok tilts down and dumps its contents into a compostable bowl. Human workers then add garnishes and additional sauces, such as avocado crema. But Spyce also has busier days when you can wait more than 10 minutes just to get to a kiosk, and another 15 minutes for the food. Spyce is also considering whether to allow customers to order in advance via the Web or a mobile app and skip the line. Typically, about three staffers work in the store at any given time. The number can range from two to four, depending on time of day. Boulud, who has also been an investor in Sweetgreen, the salad-and-grain-bowl chain, helped connect Spyce with the startup’s full-time executive chef, Sam Benson, and introduced the company to other chefs who have invested in Spyce, including Thomas Keller of the famed French Laundry in Napa Valley, Calif.
Boulud says that urban office workers tend to have a rotation of five places they go to pick up lunch; for Spyce to succeed, he says, it needs to earn a place in that regular rotation. It can’t just be a one-off novelty. Maveron, one of the venture capital firms putting money into Spyce, was cofounded by Howard Schulz, the founder and former CEO of Starbucks. It also helped back the chain Potbelly Sandwich Works, now publicly traded, which is one of Spyce’s neighbors on Washington Street. I was curious whether investors were betting on Spyce’s ability to produce food more efficiently than competitors — or if they felt the bigger potential was creating a new national restaurant brand like Potbelly. John Pepper, owner of the burrito chain Boloco, says he has met with Spyce’s founders and believes their food-production equipment could be useful for restaurant chains like his. But while he considered investing in Spyce, he feels that the expectations for how successful it may be, based on this first location, may be a bit out of whack: “They’re getting the valuation of a tech company for a restaurant brand,” Pepper says. But customers will allow Spyce to grow successfully only if they’re passionate about the food. The last automat in the country, a Horn & Hardart outpost in Manhattan, shut down in 1991. But I wonder how much venture capital you could raise in 2018 on the magical concept of prepared food stored in little cubbies and sold directly to the customer, with no cashier involved.